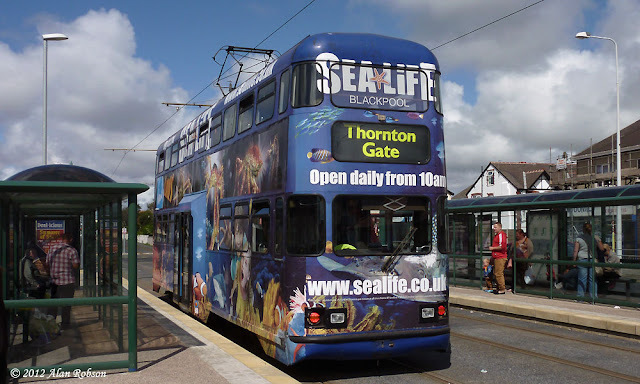 As there were no heritage tours scheduled today due to faulty points at the Pleasure Beach, it was decided to employ the two sets of crews on specials instead. 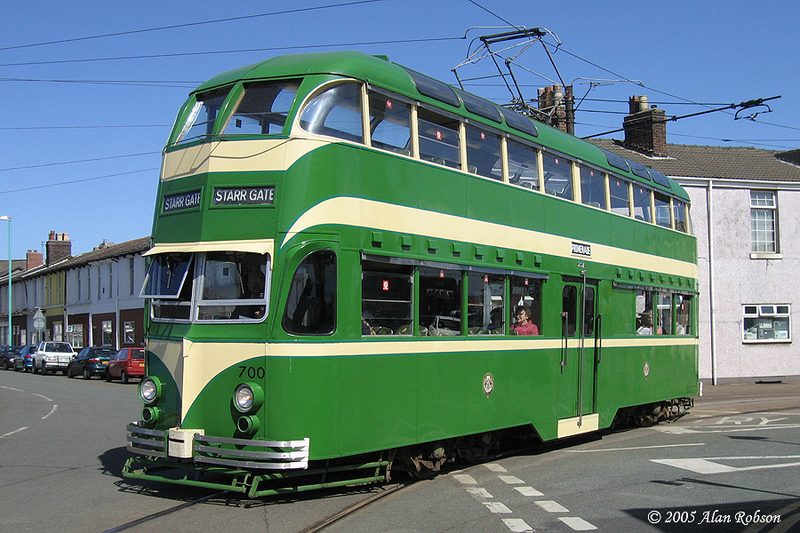 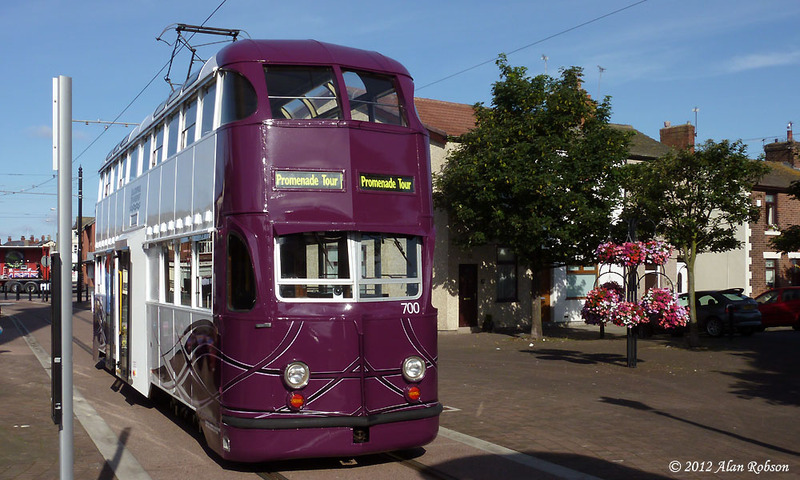 The trams selected were Balloons 700 and 709, running northbound to various destinations, and turning back at the Foxhall due to the Pleasure Beach loop being out of bounds because of the points problem. 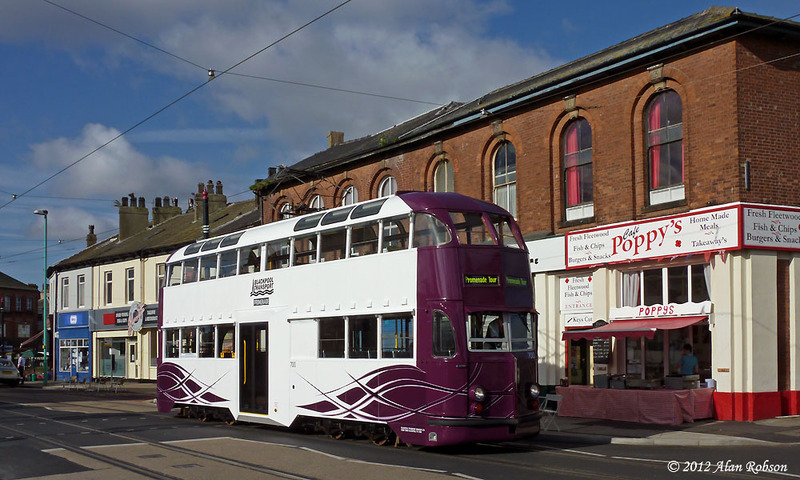 The day afforded the many enthusiasts that were around plenty of opportunities to get sunny shots of the Flexities and Balloons passing each other, and also the chance to ride Balloons in normal service instead of on a heritage tour. 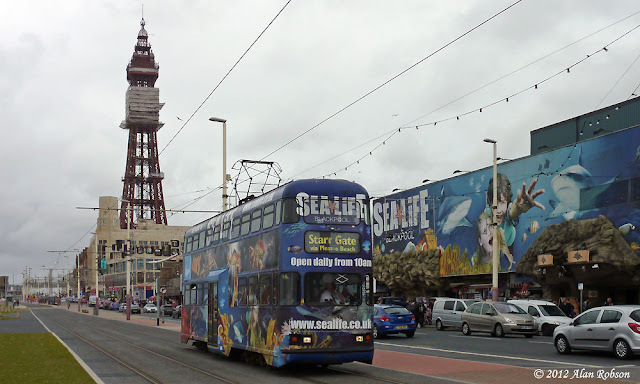 A selection of photos taken during the mid afternoon are shown here. 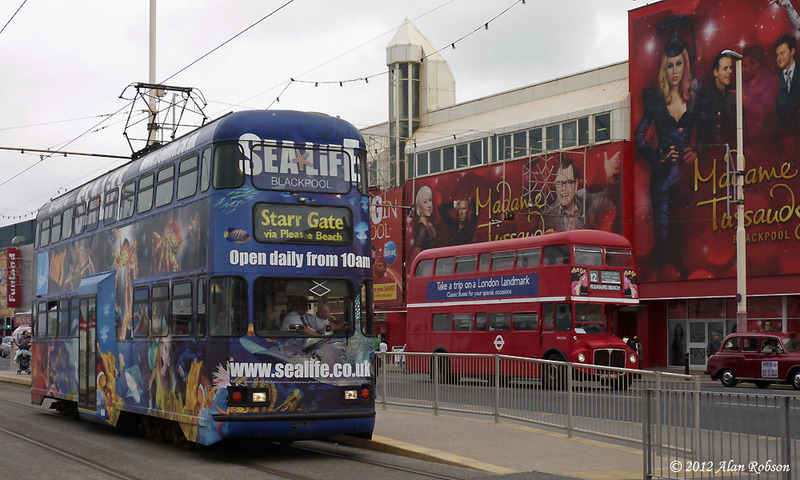 Around 0630 on Saturday morning, a motorist driving a blue MG convertible lost control of his car at Harrow Place on the South Promenade and struck a lamppost, the driver unfortunately suffering fatal injuries. 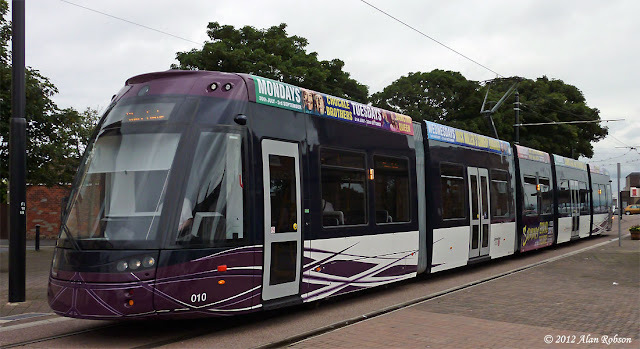 The car ended up stranded across the tram tracks, thus blocking the exit route for trams departing Starr Gate into service. The only Flexity to make it into service before the closure of the tram tracks was 012. 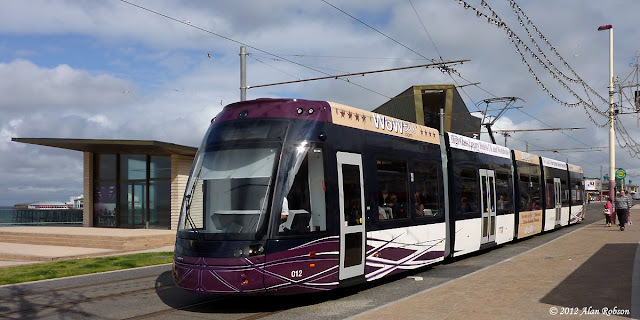 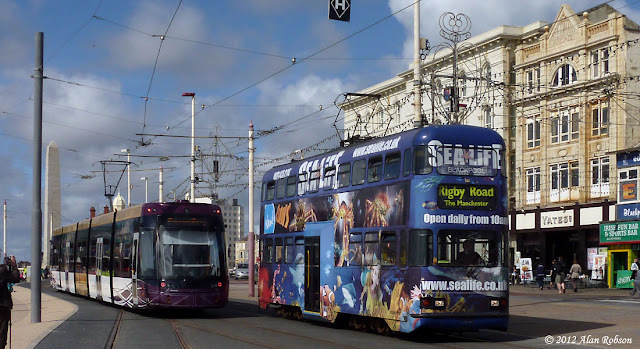 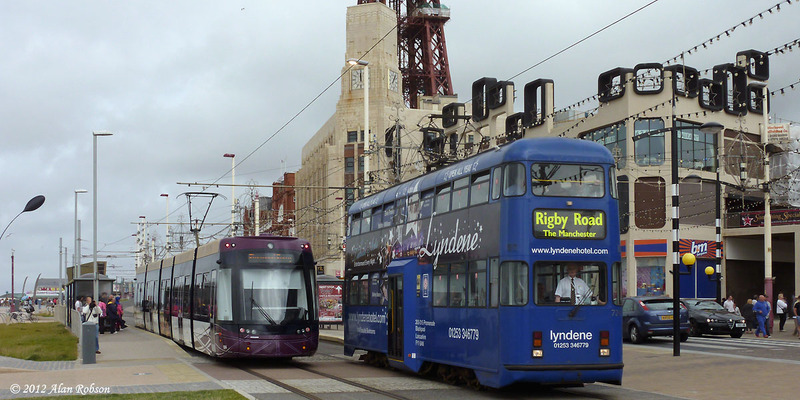 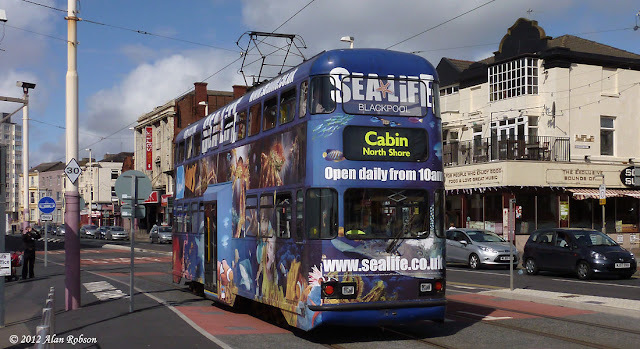 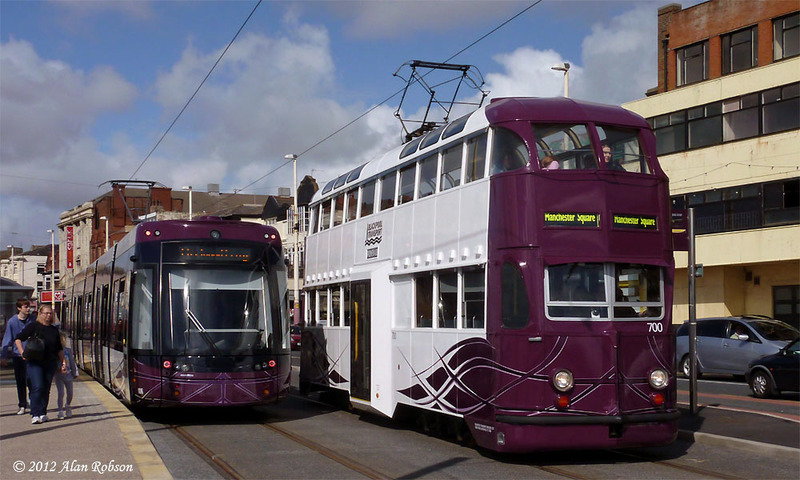 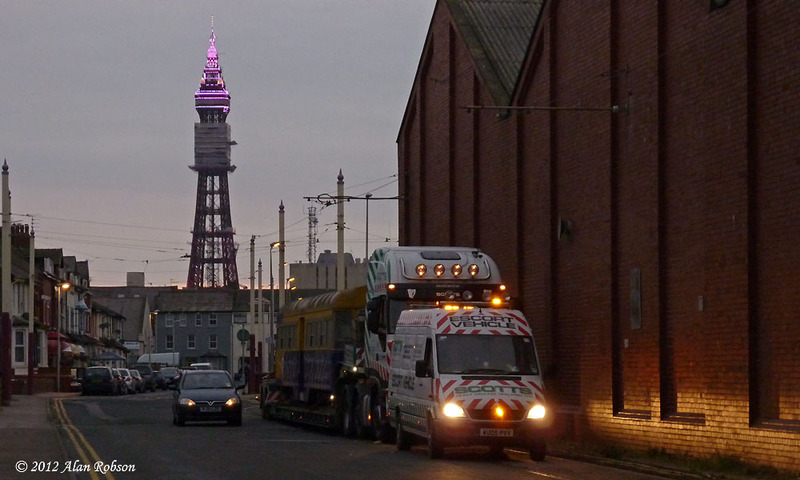 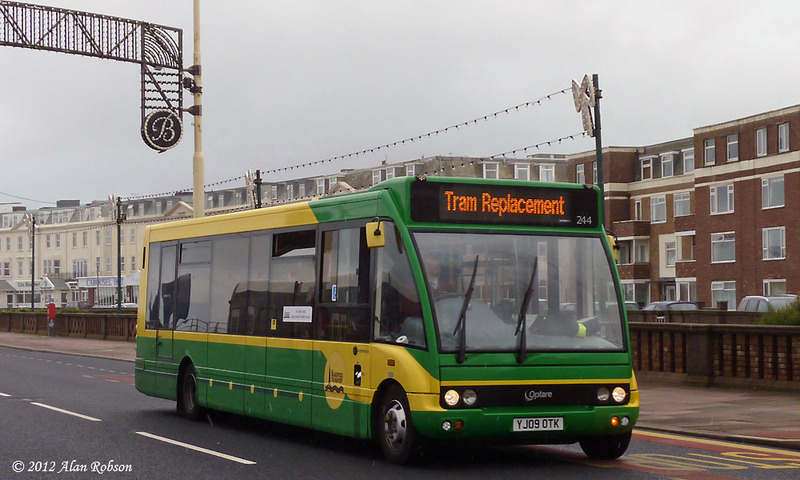 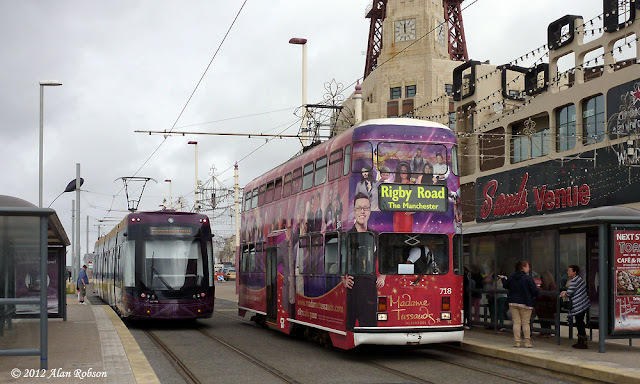 Blackpool Transport made the decision to use some of the serviceable widened Balloons from Rigby Road to assist with the shortfall, with 700, 709, 718 and 724 being pressed into service, Optare Solo buses were also used as part of the Flexity replacement service. 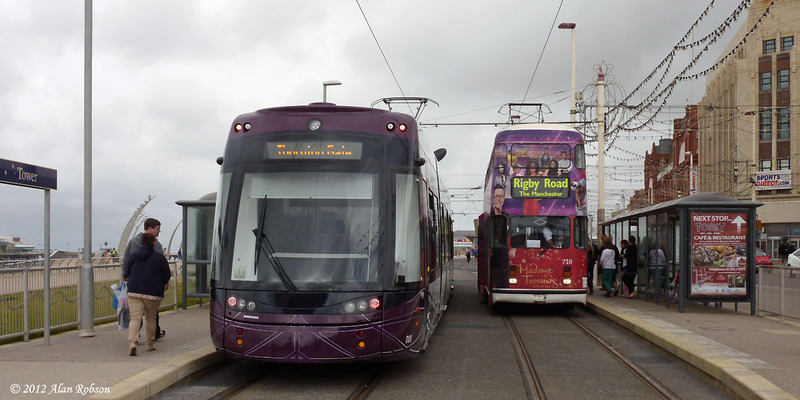 Around lunchtime the tram tracks on the South Promenade were reopened, enabling the Flexities to begin entering service, at which point the Balloons began running into depot, starting with 724 and 718 which returned to Rigby Road around 1300, 709 ran into Starr Gate depot at 1330, with 700 running into Rigby Road about the same time. Balloons 700, 709 and 718 were all making their first normal service runs of 2012, 724 having already made its debut into service on 5th April. 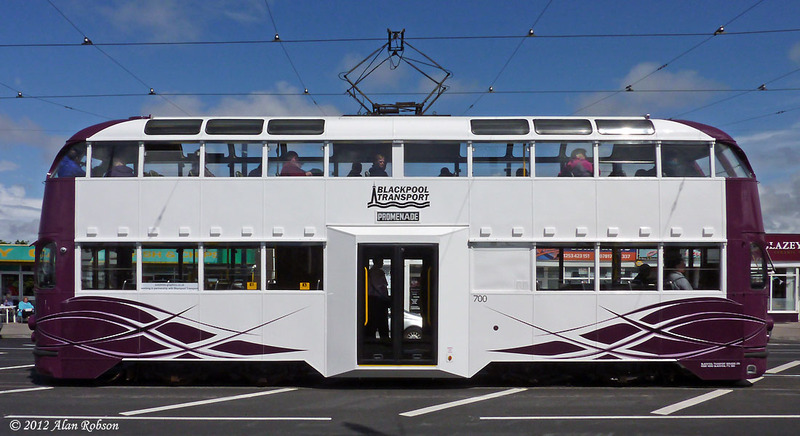 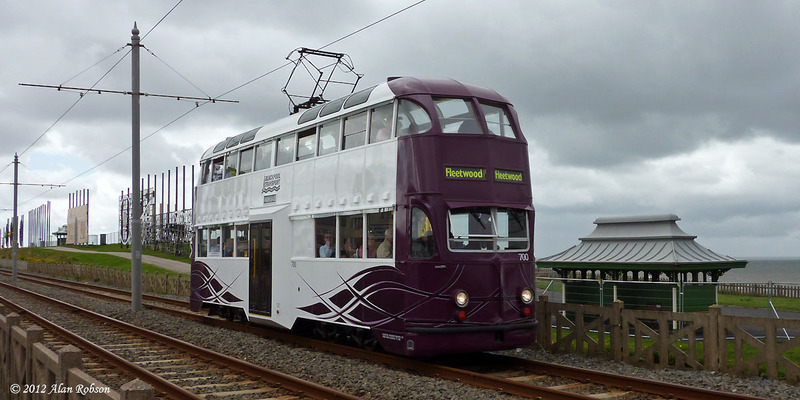 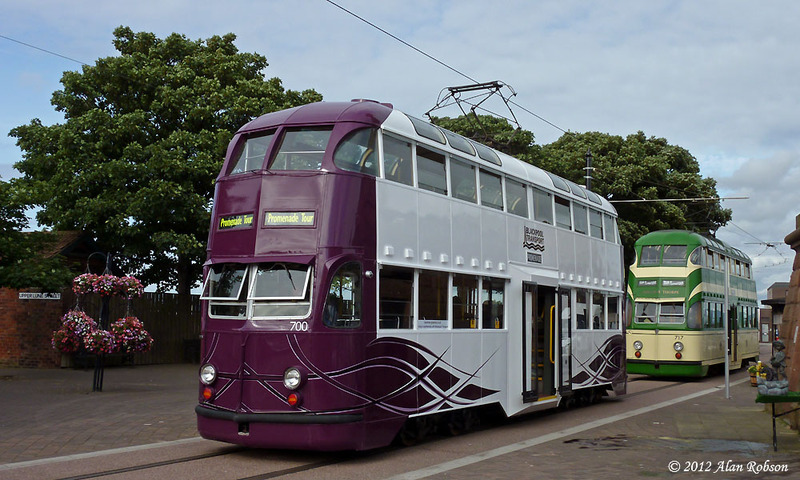 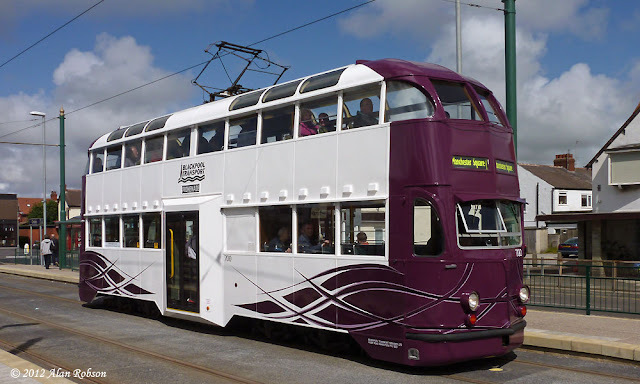 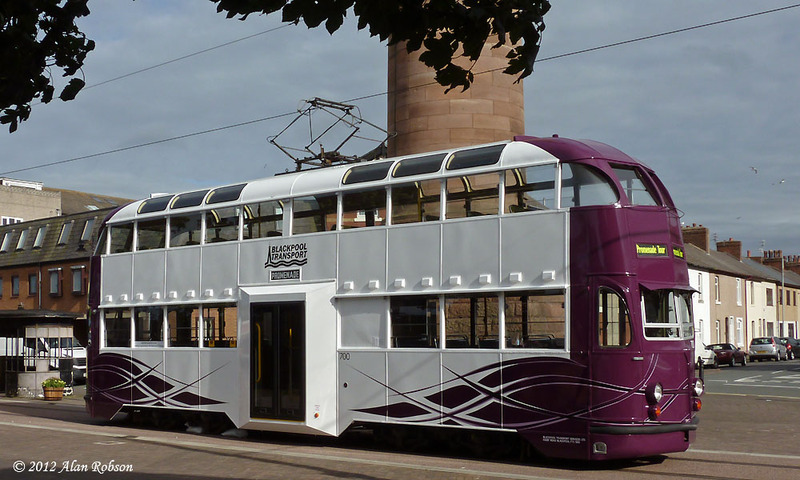 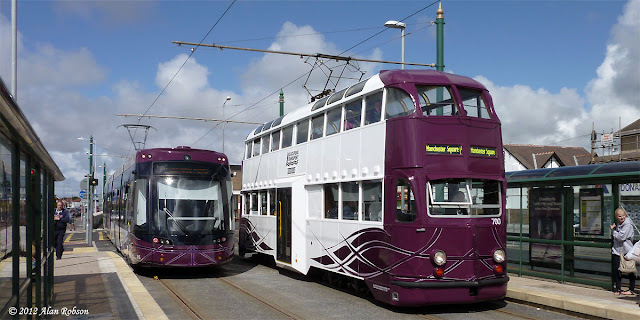 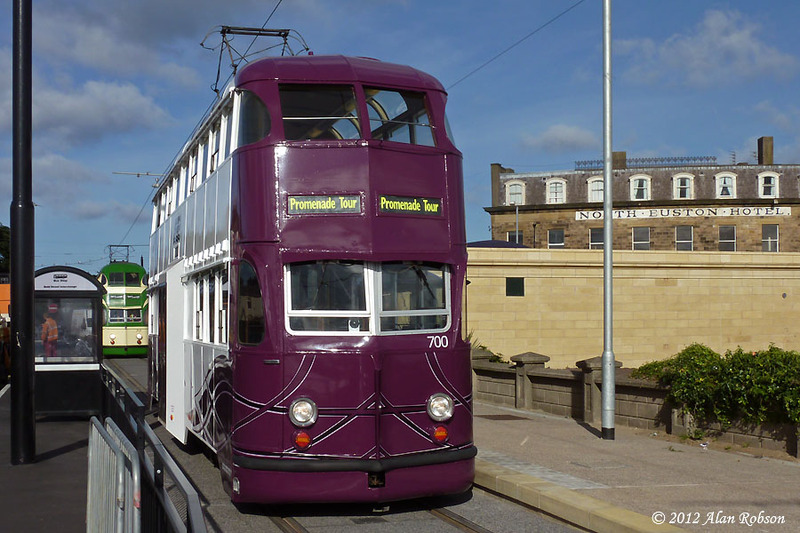 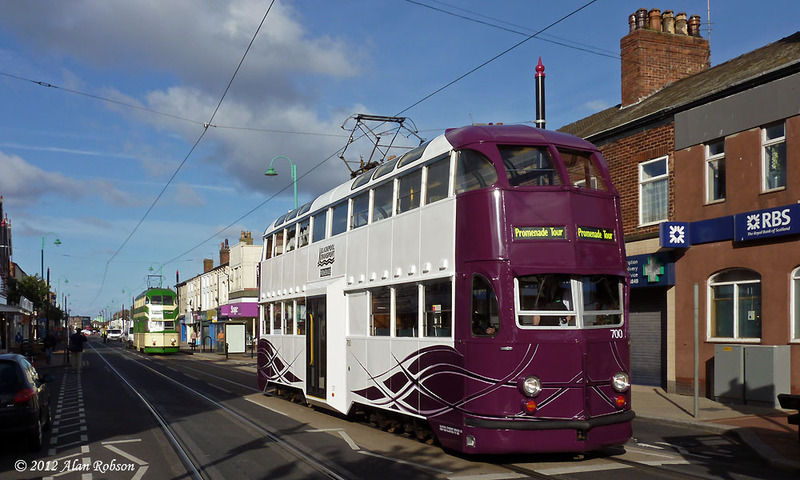 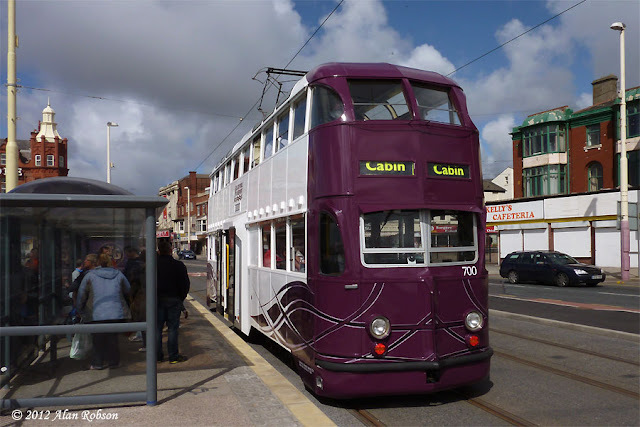 700 had previously put in an appearance on the Heritage Tour in its all white guise on 21st April, but this was its first service use, and also its debut into service in the newly applied purple and white Flexity livery. 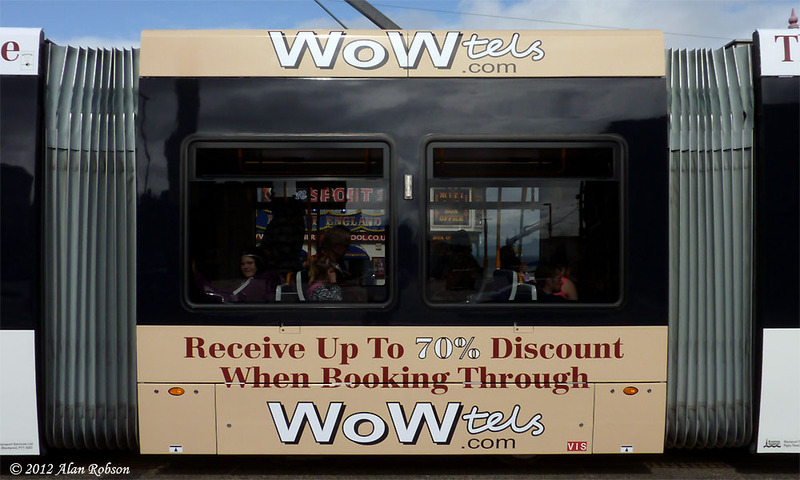 Flexity 012 was noted in service today with new single sided advert for WoWtels.com (a luxury hotel website). Beginning with the Redrow Homes advert which made its debut on Flexity 011 on 9th June, here are some closer views of the centre section adverts that have appeared since then on Blackpool's new supertrams. 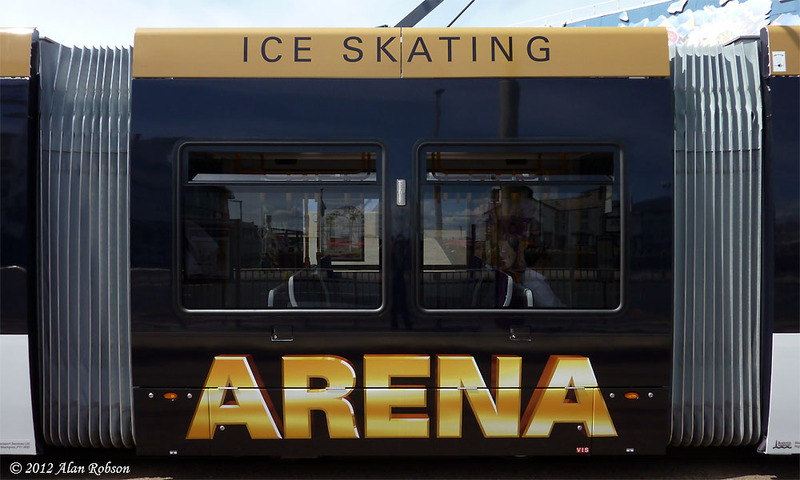 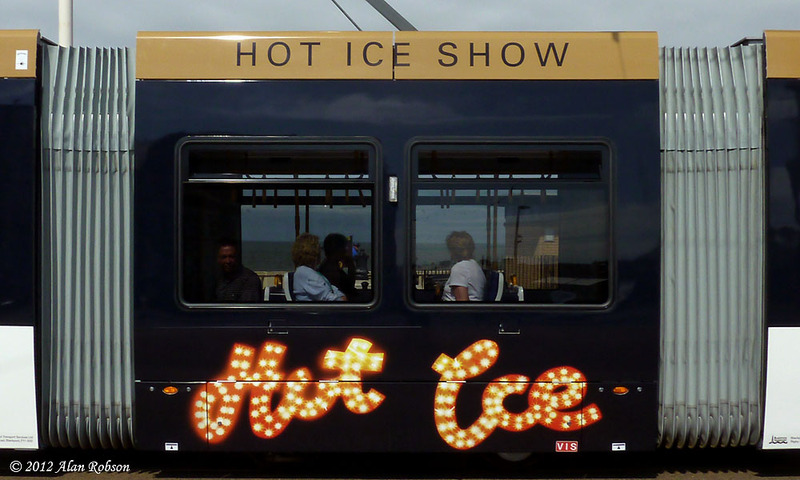 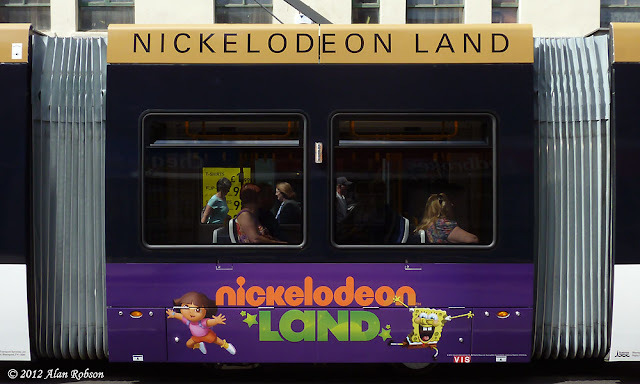 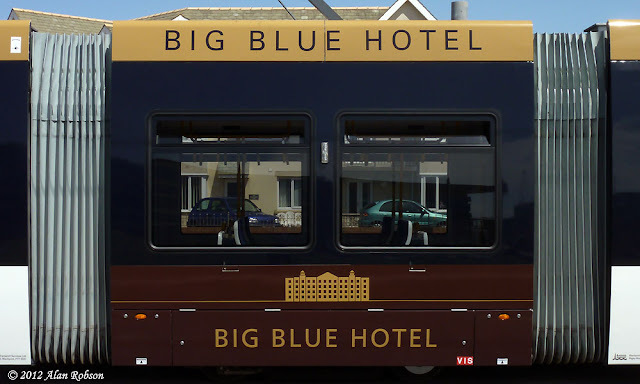 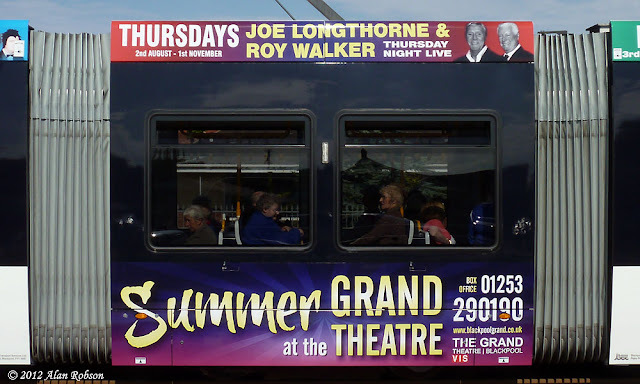 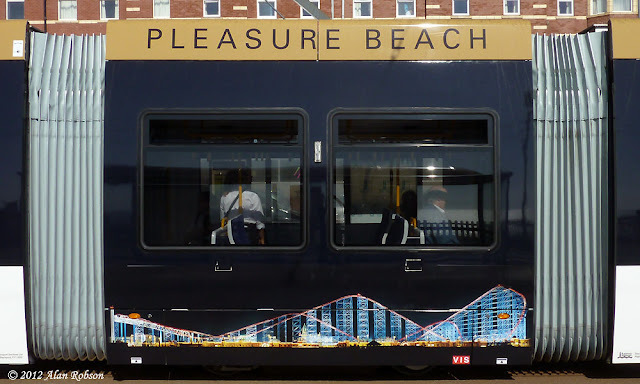 The Pleasure Beach have been a sponsor of several of the adverts on the new trams, all with a common style of plain text on a gold colored background along the roof level panels, with the centre section of the tram featuring the theme of each advert on the below window vinyls. 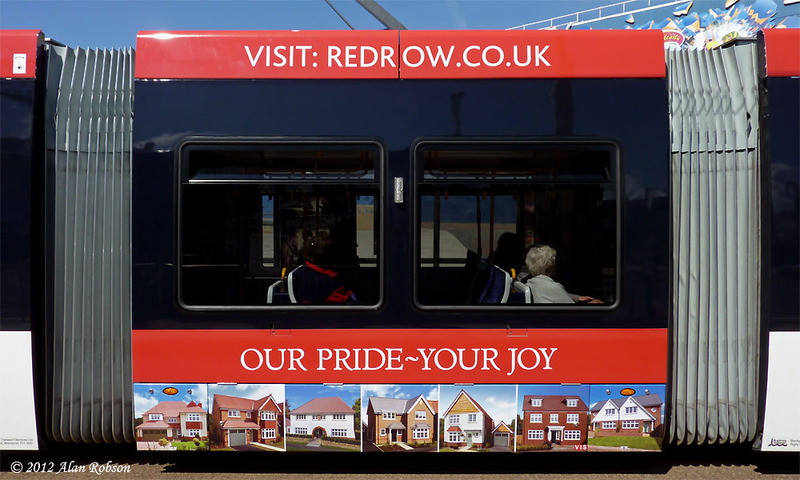 When the adverts on Flexity 010 had been completed on 20th July, these made a refreshing and colourful change from the run of six Pleasure Beach adverts that had been applied over the previous weeks. Flexity 010 has became the first of the supertrams to carry two different adverts, one side of the tram carries an advert for the Grand Theatre while on the other side there is an advert for Stanley Park's Art Deco Cafe. These two designs make a pleasant change from all the look-alike adverts for the Pleasure Beach that have been applied to six of the new trams, these adverts have the same plain font and text colour on identical gold backgrounds right along the roof line panels. 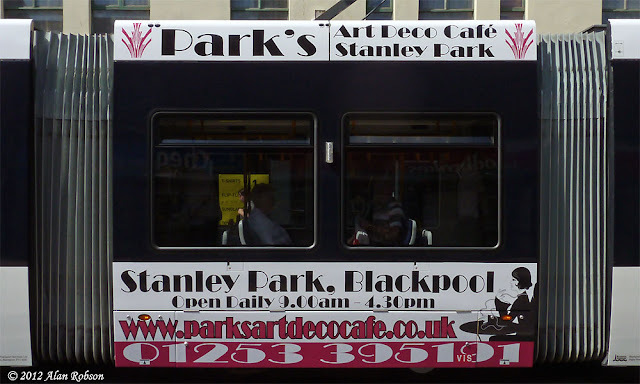 The Grand Theatre advert on Flexity 010 has multi-coloured roof line graphics that feature a mixture of words and pictures in a billboard style, while the Stanley Park Cafe advert uses an Art Deco font type in black and pink on a white background along the roof panels. These adverts show what can be done with a little bit of imagination, the Pleasure Beach roof adverts appearing rather plain and uninspiring by comparison. 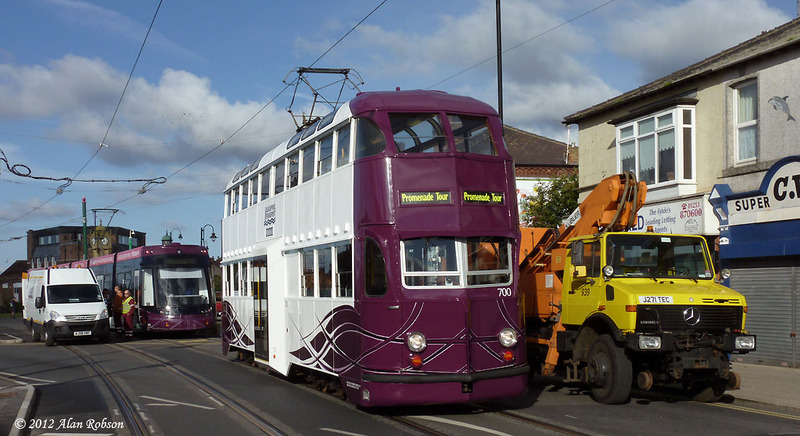 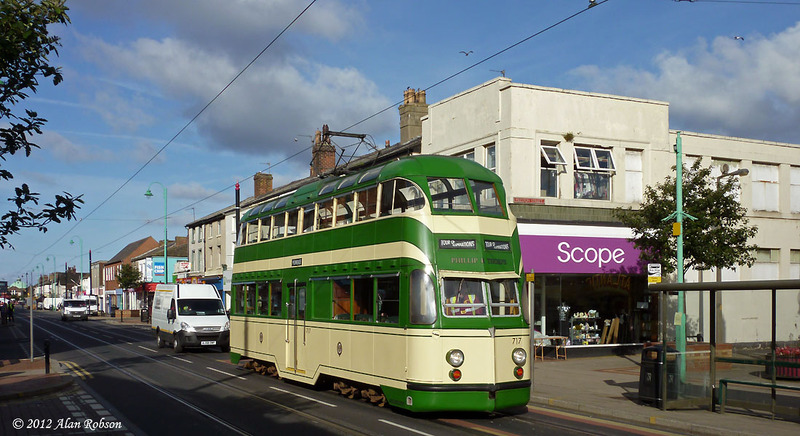 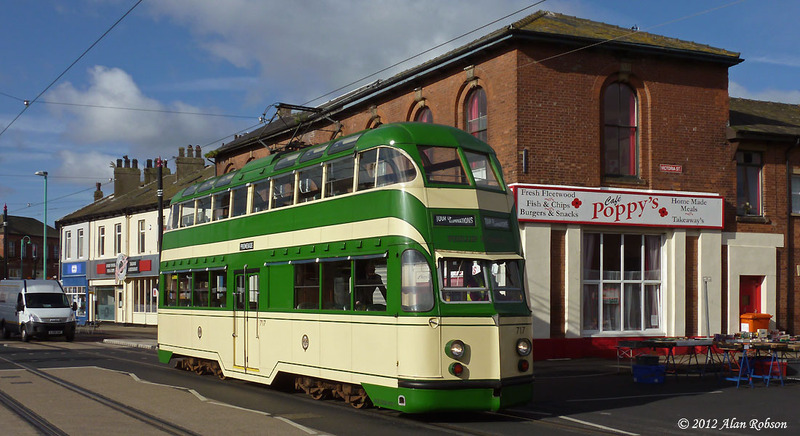 The Fleetwood Festival of Transport, otherwise know as Tram Sunday, saw two Balloons running down Lord Street together early on Sunday morning. 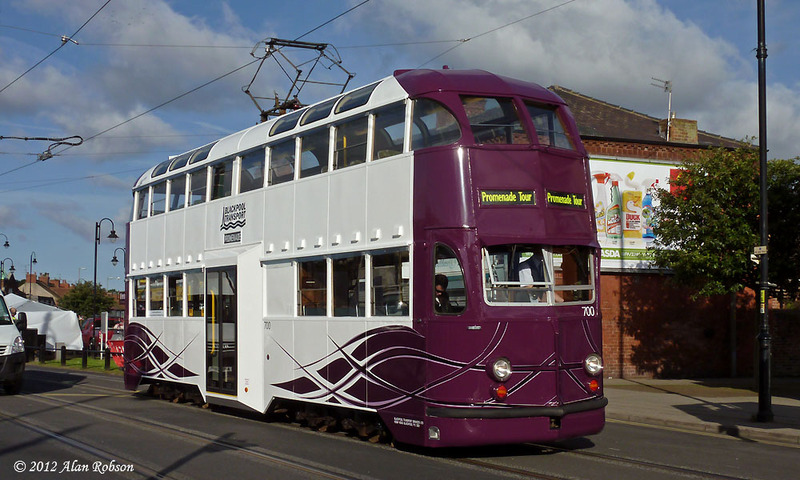 Balloon 700 made its debut in the recently applied purple and white colour scheme as worn by the Flexities. 700 turned up at Ash Street at 0740, then had to wait for Balloon 717 which was stuck behind Flexity 011, the first service tram of the day. 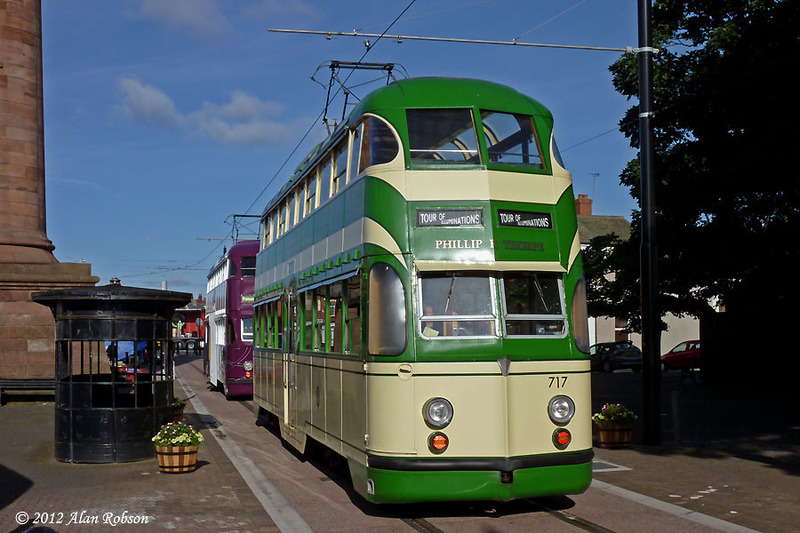 717 duly arrived, then just after 0800 the two Balloons ran in convoy along Lord Street and North Albert Street, to take up their display positions in Pharos Street shortly after 0815. 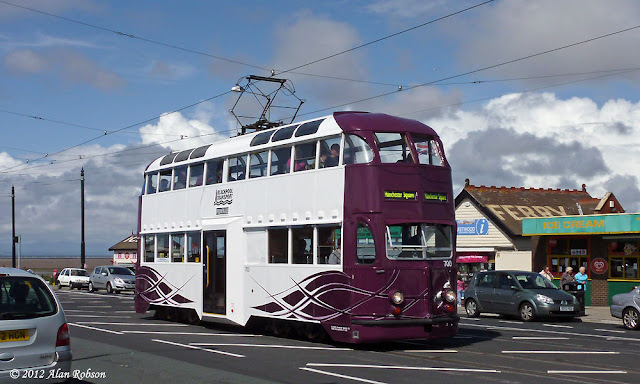 An addition to the fleet of Routemasters running on the Seafront 12 service was noted today, when RML 2391 was spotted near the Cliffs Hotel this afternoon. 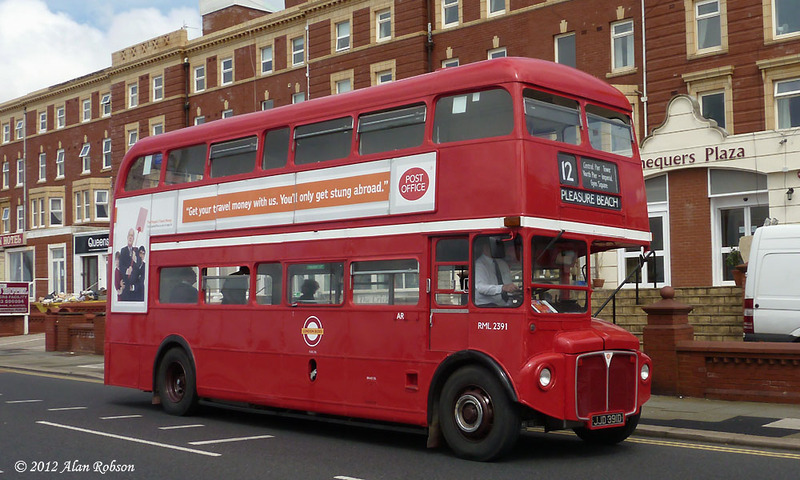 Routemasters previously seen running on the Seafront 12 have been RM 1568, RML 887, RML 2290 and RML 2734. 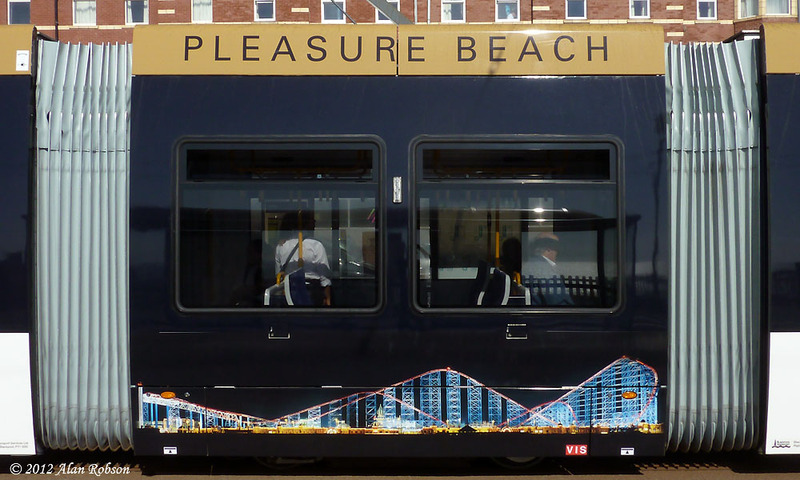 Two more of the Flexity 2 trams have appeared carrying new adverts this week, both sponsored by the Pleasure Beach and both continuing their style of plain text on a gold coloured background along the roofline, with the centre section vinyls showing the theme of the advert. 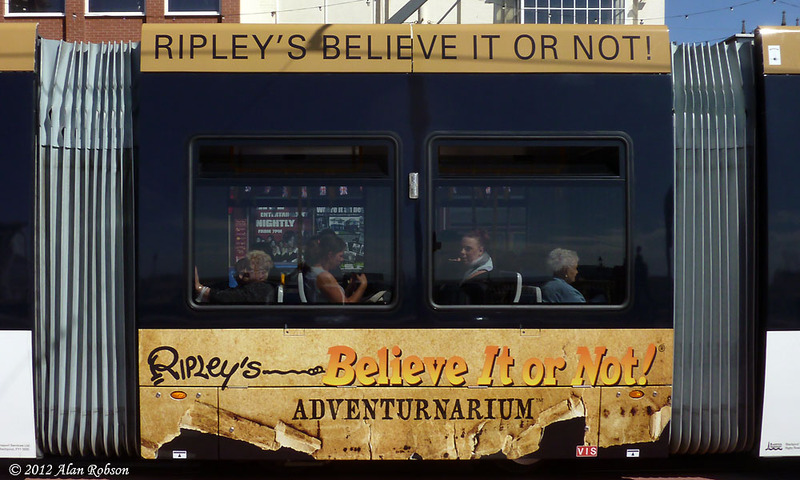 004 carries a Hot Ice advert while 013 is advertising Ripley's Believe It or Not, both attractions being at the Pleasure Beach. 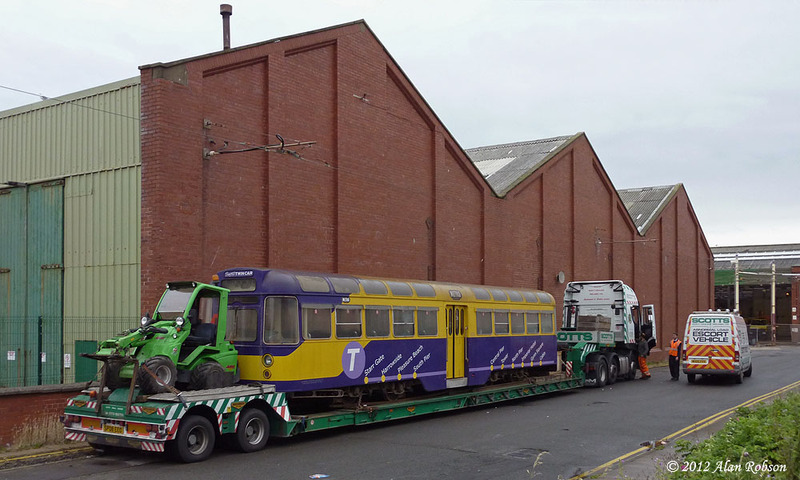 Following the departure of Twin Set motor car 674 yesterday afternoon, today saw matching trailer 684 take its turn to be loaded ready for the long journey to the North East. 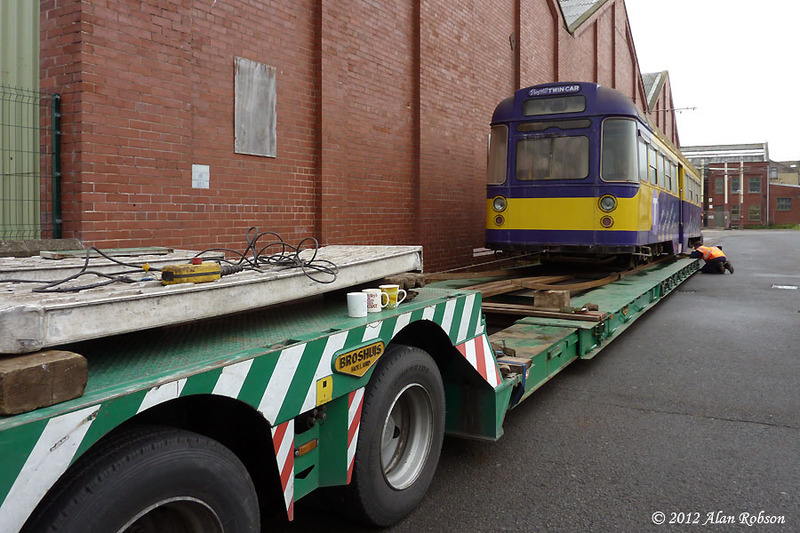 684 was pulled out of the depot by Unimog 939 and moved into Blundell Street in front of Scotts low loader. 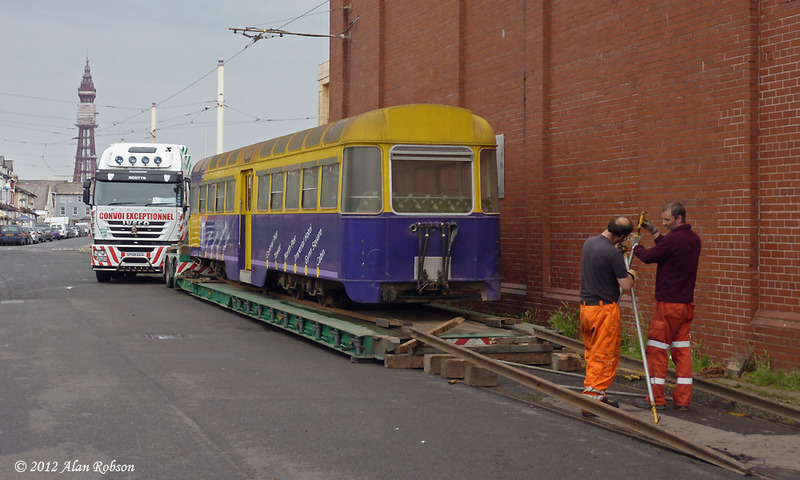 Loading began at around 1845, with 684 being pushed to the foot of the ramp by Scotts little Avant 635 loader, the trailer winch then took over at this point to haul the tram onto the low loader. 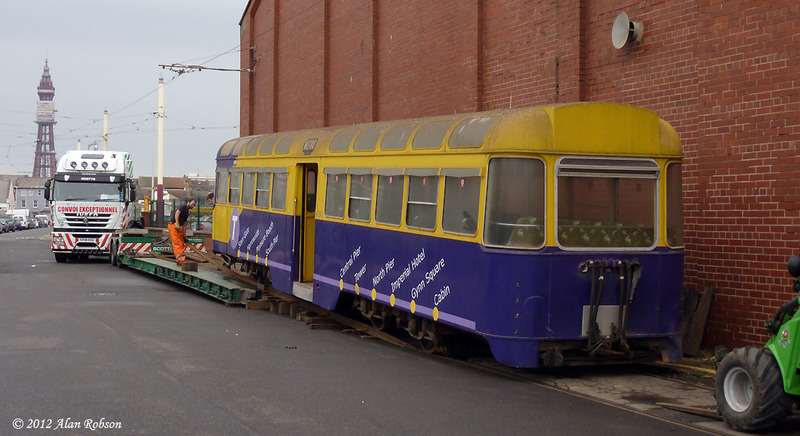 Loading was trouble free, but it wasn't until 2125 that the show finally got on the road, when Scotts low loader departed Blundell Street with its load of 684 bound for temporary outside storage at Gateshead, joining 674 and 647 which were taken there earlier in the week.